The wheels on the bus go round. Sing along! London Bridge is falling down. Rhyme along! A wonderful collection of 25 much-loved nursery songs, which encourage participation, music and mime. 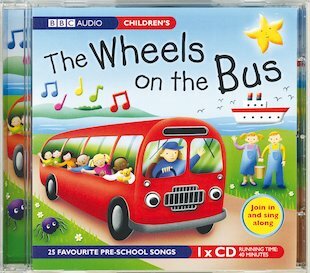 Produced by the BBC, this quality CD is packed with familiar favourites, including Row Row Row Your Boat; London Bridge is Falling Down; Jack and Jill; Hickory Dickory Dock; I’m a Little Teapot; Pop Goes the Weasel; Here We Go Round the Mulberry Bush and many more! lots of other songs are on it to.